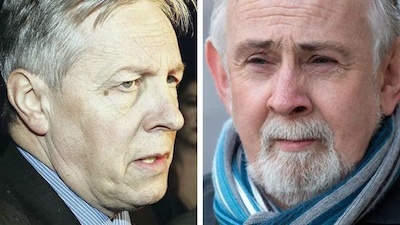 Peter Robinson’s resignation threat shows what a savage blow the failure of the prosecution of John Downey has dealt to the political process in the north. It’s not only the manner in which Mr Justice Sweeney rejected the prosecution arguments and the completely incompetent way in which the British government has handled the affair which has been grist to the unionist mill. On top of that, new information came yesterday by the hour. Originally we were told 187 OTRs (on-the-runs) benefitted from the deal. Yesterday our current proconsul admitted there were 28 more letters sent by this British government since 2010. It appears that the last letter was received at the end of 2012. There’s the DUP and poor dithering David Ford thinking justice and policing had been devolved to the north and there’s Sinn Fein laughing up their sleeves at them. Robinson’s immediate reaction to that information was to threaten resignation. He had to, otherwise accept his humiliation of being First Minister while the Deputy First Minister knew justice and policing hadn’t really been devolved and for all Robinson knew the same Deputy First Minister had been handing over names to the secretary of state of people he wanted given letters. None of which would do anything to develop the sense of humour for which Gregory Campbell and Depooty Dawds are so well known. Never advocates of the peace process, much less the political process of the last seven years, they and other DUP MPs can have had only one reaction: that the DUP was sold a pup in 2007, that Sinn Fein made eejits out of them. Clearly several DUP figures want out of the power-sharing administration for they have never operated it. Now they have the lever. Unionist politicians love being the injured party. Even more useful than donning the mantle of victimhood, the Downey affair allows the DUP to claim, as they have already done, that they warned Trimble and the UUP in 2001 that you couldn’t trust Tony Blair and that he and his close circle were up to all kinds of nefarious deals with Sinn Fein. What the DUP naysayers choose to forget as they rewrite history is that Blair and Jonathan Powell were finalising the deal on the OTRs in 2006-7 while the DUP, not the UUP, was in negotiations with Blair as the largest unionist party. To their intense embarrassment and outrage it transpires that Sinn Fein cleverly used final decommissioning of their armoury as a bargaining counter for the deal on OTRs. The DUP demanded that Sinn Fein decommission, stand down the IRA and support the PSNI as the price for entering a power-sharing administration. Did it not occur to the DUP that Sinn Fein might have their own demands before they agreed to anything on that list? Now the DUP have found out one of Sinn Fein’s demands. Who knows how many more were conceded or what they were? Blair’s adviser Jonathan Powell gave a statement in support of Downey’s legal team, further reason for the DUP to grind their teeth. It has come to this pass because no one in Cameron’s government had the guts to stay the prosecution months ago. If that had been done or even better, someone had tipped the Metropolitan Police the wink, Downey could have been released and no one the wiser. In the circumstances Robinson had to threaten to resign. He probably won’t go of course. He hedged his threat with sufficient waffle about a full judicial inquiry and demands for the names of those who received the letters. A judicial inquiry will take months and will find that Blair’s government acted appropriately in the special circumstances. After all, didn’t he release 400 or so prisoners by 2000 in a partial amnesty and they’d been convicted? Yet the OTRs have been convicted of nothing. As Blair agreed in 2000 they were ‘an anomaly’ with convicted IRA members being released. He wanted to wipe the slate clean. The only logical objection unionists can have to the latest revelations is that they were, as Robinson complains justifiably, ‘kept in the dark’. Nonetheless the developments in the last 24 hours are the most serious threat to the political process since the collapse of the assembly in 2002 after the allegations of IRA spying at Stormont. Robinson has not just been kept in the dark by our proconsul but more importantly by Martin McGuinness. Robinson won’t walk away but senior members of his party will be telling him that it’s too damaging to the DUP to stay. This affair has wounded Robinson, perhaps fatally.